Learn the basics and go 5-0 in the MTG Arena Singleton event. With each new expansion, Magic: The Gathering continues to evolve beyond what most anticipated. But it’s easy to get stuck in a rut and bored with the game when you keep going up against the same type of decks. This is where Singleton decks come in, shaking up gameplay in MTG Arena. A Singleton deck can only have one copy of a card, not including basic lands, unlike other formats where decks can have up to four copies of a card. Each time you play a Singleton match, it’ll feel fresh and different. Having only one copy of a card in a deck, however, poses many challenges—and the main one is deck construction. 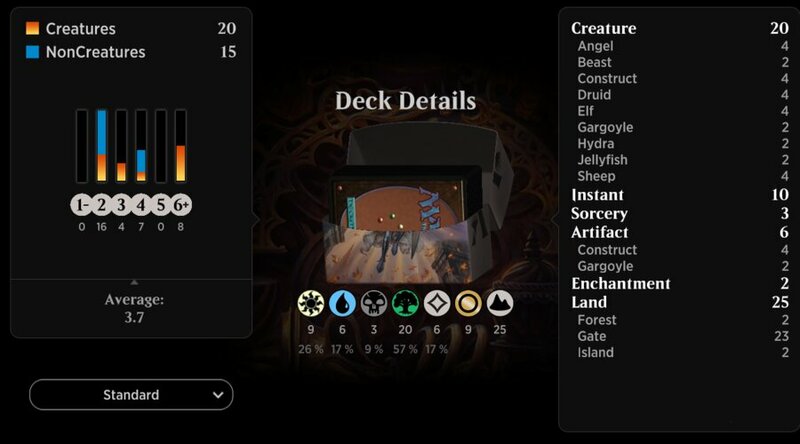 Known as net-decking on MTG Arena, players will export a popular deck into their library from the internet and attempt to play it without making adjustments. Instead, use decks other players have built as a foundation and a chance to learn. Once you understand the overall theme of a deck, go through your library and seek out cards that could be a good fit. Then replace them with ones you don’t have, or aren’t thrilled about playing with. Constructing a Singleton deck from scratch isn’t easy, but it’s fun. Typical card combos rarely work in Singleton, but choosing similar mechanics will. Take, for instance, card draw. In a Singleton deck, having card advantage can be a game changer. Mono-blue decks capitalize on card draw in combination with counters and card displacement. Most of these mechanics in blue have a cost of less than four mana, providing tempo and the time to find that win condition card. On the opposite spectrum of blue is mono-green stompy. Rather than focusing on card draw and removal, the goal is mana curve and creatures. 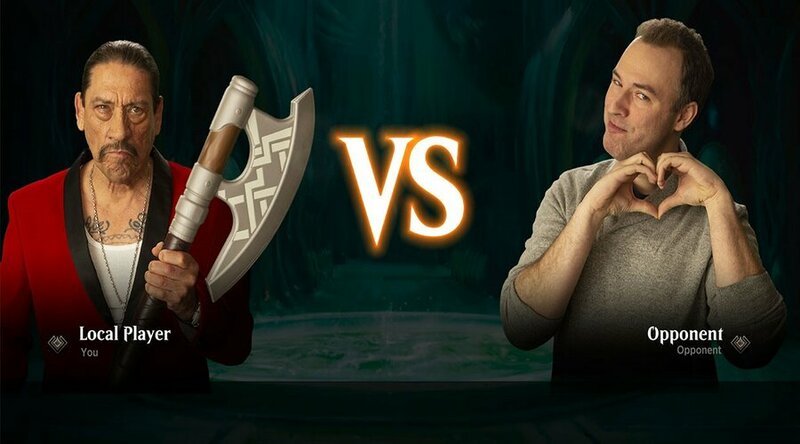 Themes that work in normal Standard and Limited matches potentially become janky decks in an MTG Arena Singleton tournament. Be careful with adding too many colors to a deck, too. Splashing various bombs in a deck is fine but doesn’t always work. Combat tricks shouldn’t be underestimated in a Singleton deck. White, red, and green contain several cards that beef up creatures at instant speed. Black and blue predominantly reduce an opponent’s power at instant speed. Having these types of combat tricks in a deck will eliminate blockers while scoring damage points on your opponent. When picking out combat tricks, look for low mana cost cards, which include flying and trample. Mana curve is imperative in all forms of deck building. When constructing a Singleton deck, it’s important to have plenty of one, two, and three drops. Save the four and larger drops for planeswalkers and bombs (cards that provide win condition and ultimate advantages). Golgari (black and green) is a popular deck in Singleton tournaments because it combines increasing mana (green) with removal (black). Cards like Llanowar Elves, Druid of the Cowl, Incubation Druid, Elvish Rejuvenator, and Grow from the Ashes provide mana ahead of curve. These then open the door for large creatures like Carnage Tyrant and Doom Whisperer, along with removals. A balance of creatures, spells, enchantments, planeswalkers, and lands is an absolute must in Magic: The Gathering. Creature-heavy and aggro decks should run around 22 to 24 creatures. Control decks are the opposite, typically running six to 10 win-condition cards. Spells and enchantments in creature decks run around 10, with a focus on removal and combat tricks. Meanwhile, control will run around 20 or more. In control decks, be sure to balance counters with card draw and removal. Both deck styles run an average of four planeswalkers. Lands are often overlooked but are equally important. Try to incorporate duel lands, especially the ones where two life can be paid so they don’t come into the battlefield tapped. Lands typically run from 22 to 26 cards depending on the mana curve. 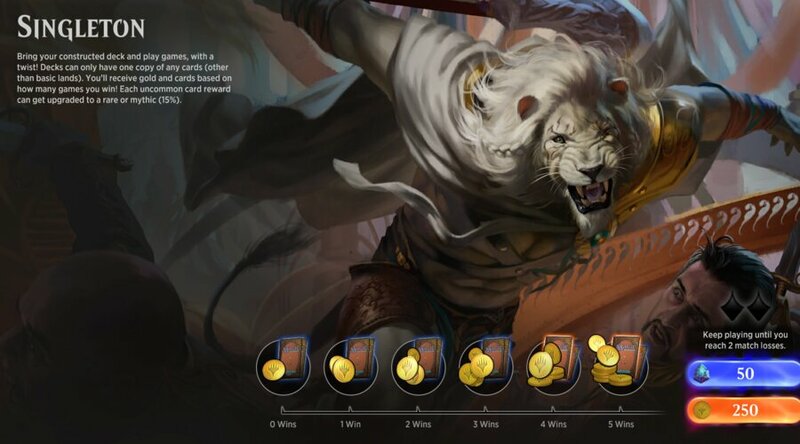 When playing a Singleton tournament on MTG Arena, an opponent is bound to have either a Rat Colony or Persistant Petitioner deck. Nobody likes going against these decks, but they have high win averages and are fun at times. Rat Colony is a two mana (one black) creature with a power of two and defense of one. It also gets +1/+0 for every rat you control. The kicker, however, is that you can have any amount of Rat Colony cards you want. 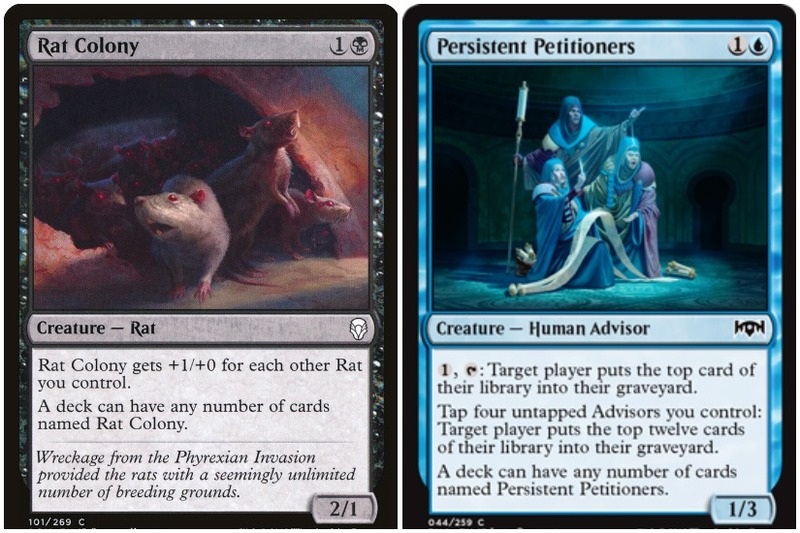 The same goes for Persistent Petitioner, a two mana (one blue) creature that focuses on milling out an opponent’s deck. The way to eliminate these types of threats is through board wipe cards like Cleansing Nova, Ritual of Soot, Settle the Wreckage, and Kaya’s Wrath. Prison cards like Ixalan’s Binding, Conclave Tribunal, and Seal Away will also remove a Rat or Petitioner threat. Having creatures with first strike destroys rats no matter their power level. In addition, having large creatures that can block multiple attackers helps, too. Playing a Singleton tournament on MTG Arena is fun and a good change of pace from Constructed and Limited. The most important tip when playing is to have a strategy in place for your deck of choice. Then take the time to pick out mechanics, spells, enchantments, creatures, and planeswalkers. Try to avoid splashing too many colors and high mana cost cards. Keep it simple, quick, and deadly. Or lock up all your opponent’s moves until your win condition comes into play. And don’t forget your combat trick cards. Singleton and Pauper events on MTG Arena are either free or very cheap. Play often to improve your skills while paying attention to what other types of decks your opponents have. Going all the way (5-0) usually means playing a deck that can compete against the top five being played. Most importantly, have fun. Singleton events don’t happen all the time on MTG Arena, so enjoy them while you can. Don’t be afraid to try new cards or use wildcards to unlock a single version of a card you don’t have.